Once upon a time there was a fatherly sky God. He was worshiped by all the people in the land. Sacrifices were made to him, words of wisdom attributed to him, and miracles performed by him. The land that worshiped this god would go on to become one of the most powerful and influential cultures the world had ever seen. Indeed the learnings from this land became the basis of law, math, science, philosophy, religion and democracy. The land was Greece. The god was Zeus. Today Z is for Zeus. 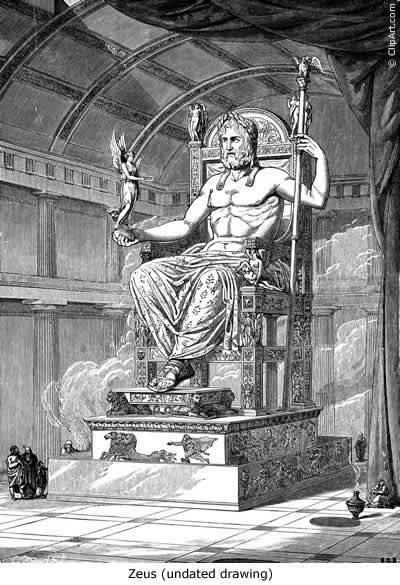 No one worships Zeus anymore. In fact if you ever hear someone say they do you might think the person was telling a joke. To the vast, vast majority of Jews, Christians and Muslims the thought of Zeus' dimity or worship status is unthinkable. Yet. There is it. Out there. We still have some temples standing to the ancient Greek gods. Constellations are named after the heroes and monsters of Greek myth. There are cities that still stand that were named for them (Athens anyone? ), the greek gods were worshiped then, but no longer. The Bible never mentions them. The creation myth in Genesis never takes them into account. Yet to 1000s of people they were real. More real than some desert god who's story seems to have grown out of the myriad faiths of the area. Zeus is not real because no god is real. I have mentioned in the past that I had read "D'Aulaires' Book of Greek Myths" as a child. They mentioned how Zeus was not longer worshiped and had died. That was quite the paradigm shift for my young mind. It dawned on my that gods didn't die, because they were never alive to begin with. They are all just stories. There is a saying in the atheism movement, "We believe in one less god than you." Think of all the gods you don't believe in and maybe you will see we are closer to same opinion than you think.